In the United States, as in most countries, there are certain foods that we associate with certain meals. Cereal is, most often, a breakfast food, as are eggs and oatmeal. Lunch meat sandwiches are most frequently found at lunch. And lasagna and meatloaf are most commonly sighted at dinner. 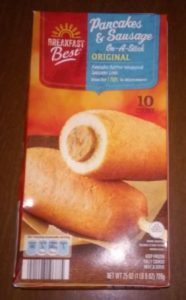 And yet, here is Aldi, marketing a breakfast food that looks suspiciously like a corn dog. The Breakfast Best Pancakes and Sausage On-A-Stick (man, that’s a mouthful) comes in the frozen section with ten servings. They can be cooked from frozen or thawed, although the instructions on the box warn consumers not to refreeze if thawed. They also warn to cook the dogs — er, pancakes on a stick — to an internal temperature of 160 degrees. The box offers two methods of cooking: microwave or oven. The microwave instructions have the virtue of being fast — no more than a minute from frozen. The oven directions, by contrast, are pretty long: at least 22 minutes from frozen (16 minutes if thawed), cooked at a temperature of 375 degrees. If you’re in a pinch, it’s probably clear which way is the winner here. If you have time, though, we recommend the oven. 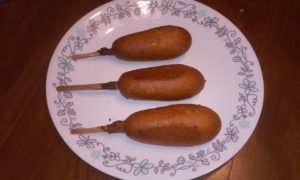 Yes, it’s 22 minutes, but there is no flipping or hassle involved, and when they come out they are beautifully crispy. What that means for you will depend on your tastes. Even though it is composed of breakfast foods, it doesn’t taste quite like a breakfast food. But it is pretty tasty. It’s a little weird by breakfast food standards, but it’s actually pretty tasty. You can heat it in the microwave for a minute, but we actually suggest giving it its 22 minutes of due in the oven if possible. These are by no means rare or unusual. Jimmy Dean has been selling several varieties for years. Aldi tends to mimic other brands, so that’s not a surprise. However, we haven’t seen the Jimmy Dean version in our local stores, so there may be some regional tastes in play here.